The PPP go above and beyond everyday to make sure each dog in our care receives lots of love and attention. We are asking our customers what they love about our crew. All entries will be printed out and hung in our lobby or break room for all of our staff to see during employee week! It’s never too soon to make your holiday reservations, as we fill up quickly! Click here to book online! New customers must pass our 2 hour evaluation before a reservation can be placed, Click Here to sign up..
All reservations must be cancelled by the dates above to have the deposit refunded. Reservations are NOT confirmed until a deposit has been paid. Get ready for our 2018 Halloween costume contest. This contest is open to all current doggy daycare and hotel guests. If you plan to have your dog at daycare on Halloween, please make sure they have a reservation. If you are unable to attend daycare on the 31st, you can tag us on social media with a picture of your pooch is costume. We have teamed up with our sister business, Bubbly Paws and our friends at Westgate Pet Clinic to raise money, food and treats for Good Karma Animal Rescue. All food and treats need to be un-opened. 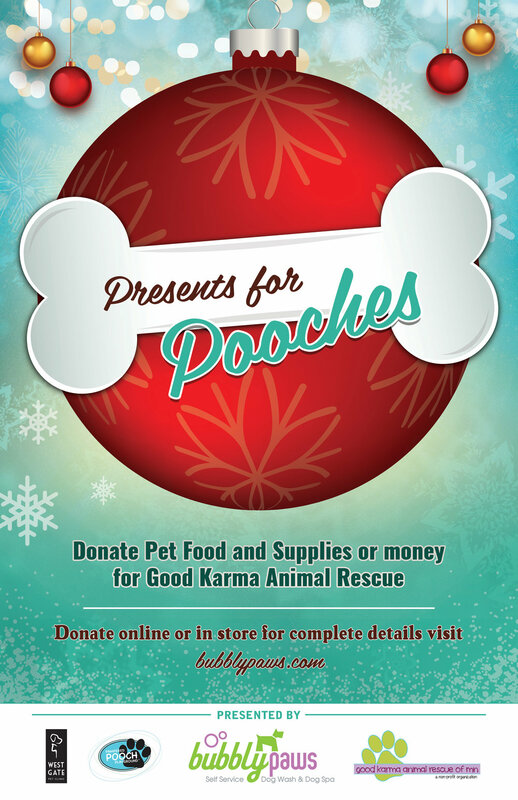 Starting Friday, November 24th until January 1st you can make donations in our lobby at Pampered Pooch Playground or online by clicking here. If you donate $50 online, by clicking here you will receive a $5 gift card to Bubbly Paws. We were on KARE 11 talking about some easy tips to keep your pooch safe this halloween! We also featured Gracie from Spots Last Stop Rescue. Keith Miller (co-owner) from Bubbly Paws and Pampered Pooch Playgroundwas on KARE 11 News talking about the dogs that Good karma Animal Rescuebrought back from Texas after Hurricane Harvey. Click here to see the available dogs. On Saturday, October 15, 2016 we received notice that one of our email accounts was hacked to send spam phishing emails. Google, our email provider, notified us 15 minutes after the activity and the account was disabled and the issue was stopped. The email sent a fake document from Docusign with a link to click. Once the link was clicked, it asked for your email address and password. Google has opened an investigation and confirmed that this hacking attempt did not originated from within the United States. If you simply clicked the link, there is nothing to worry about. If you entered an email address and password, please change the password for that email account and any other accounts that use the same combination. This issue affected a small amount of our customers, but we feel that we need to be open and honest with what happened. Poochworks, our reservation system was not affected by this. All credit cards stored with us are fully encrypted on Authorize.net. As a precaution, all master passwords were changed and a security scan was run; we passes with flying colors. We are truly sorry for any inconvenience this might have caused. Please contact us if there is anything we can do. Here is a great link on how to avoid being the victim of phishing scams. You can Make your deposit by clicking here!